Belize has an area of 8,867 square miles, the Stann Creek District is the second smallest district with 986 square miles. 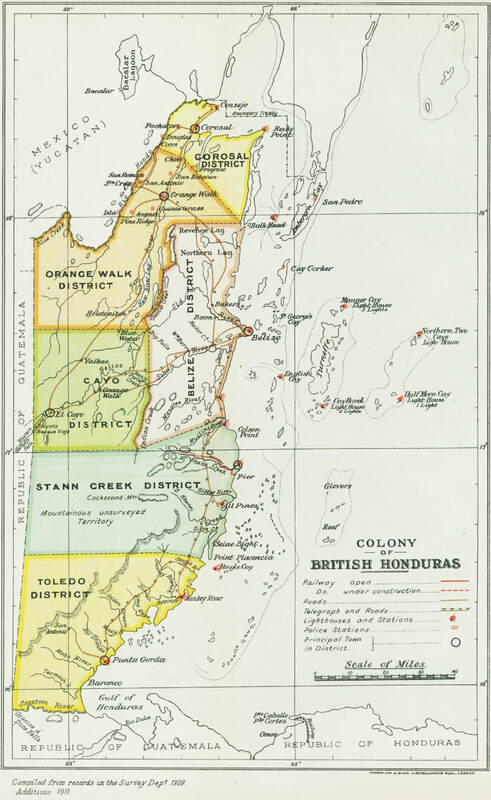 Prior to 1910 the district was 2,131 square miles or a quarter of the size of Belize (see map at end of page). During the re-arrangement of magisterial divisions of districts in 1910, 550 square miles was taken from Stann Creek and included in Toledo. A further 595 square miles was partitioned to Cayo, in 1914, reducing the Stann Creek District to less than half its original size. In the northwestern Stann Creek District lies the North Stann Creek Valley. It is bounded by the banks of the Mullins River to the north, the mountains of Middlesex to the west, the Canada Hills to the south and the flood ​plains of Melinda to the east. 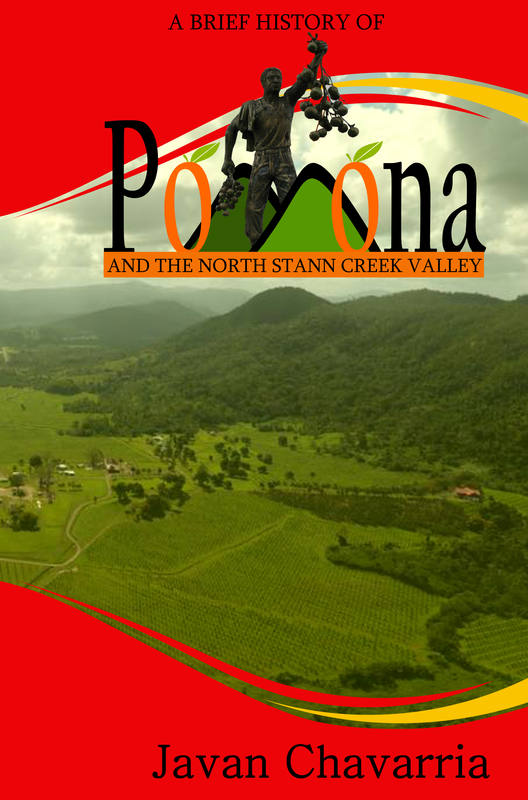 The soils of the Stann Creek Valley are undulating with some areas steeply carved from the rushing waters of the many rivers, creeks and streams coming out of the hills. 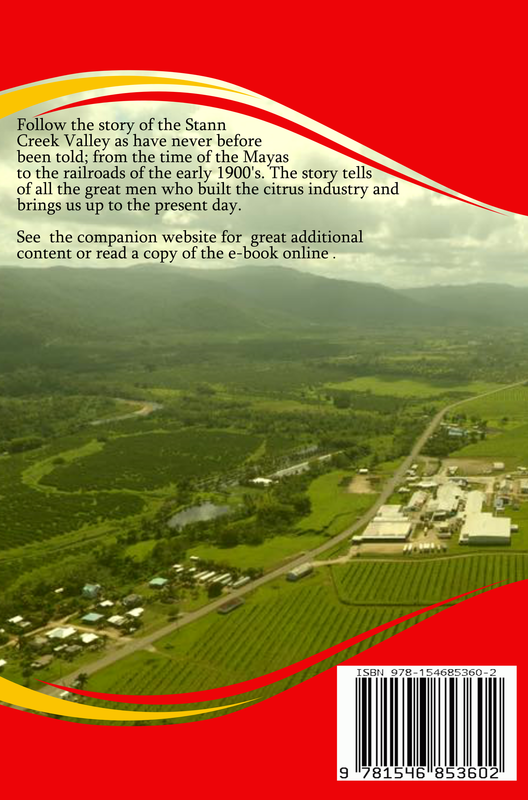 Citrus now dominates after the destruction of the banana plantations in the earlier part of the last century. The soils of Northern Stann Creek, such as the Melinda flood plain, are a mixture of recent alluvial material mixed with old flood plain granitic sand. There are swamps in the flood plains but the terrain turns to gentle hills around Middlesex. ​By definition there is no true rain forest in Belize; however, the quantity of rainfall is only slightly insufficient. Instead, the country is decorated with broadleaf jungle and cohune forest termed "moist tropical forest". This is true in the Stann Creek Valley as land that is uncultivated are broadleaf jungle with the occasional Pine Ridge on the mountain ranges and on the savannah on the Coastal Highway. ​Higher up in the valley around Billy Barquedier National Park there is tropical evergreen forest, sitting on Santa Rosa metasedimentary rocks of the Macaroni Hills that rolls towards the Manatee Forest Reserve. 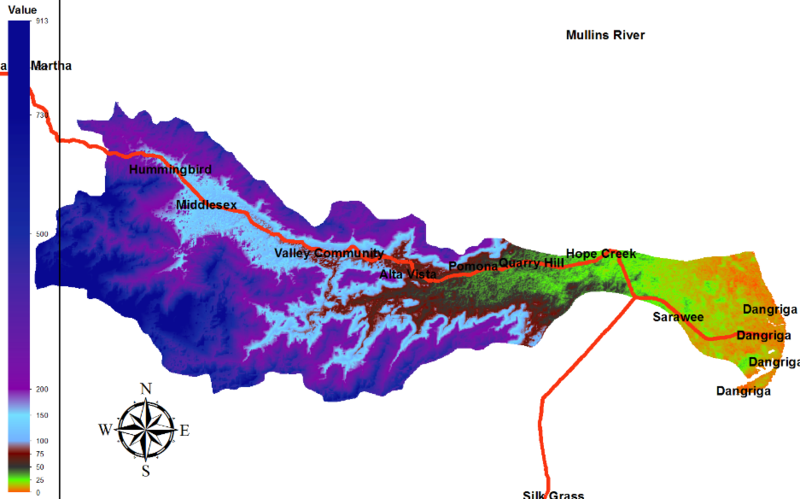 The Digital Elevation Model created in ArcGIS shows the changes in elevation in the valley. Pomona is 50 to 75 feet above sea level. Middlesex is over 150 feet and the end of the valley can be seen clearly at Hummingbird Community. The highest point in the valley is Mount Mossy which rises to over 3,200 feet. This is located to the west of Middlesex in the Sittee Forest Reserve. In Pomona, the highest point is the iconic Macaroni Hill which rises over 1,100 feet. The low point of the Valley is the collection basin between the two Quarry Hills that forms the Black Creek Lagoon. The climate in the Stann Creek Valley although only a few miles from the Caribbean Sea often appears to be cooler than other areas the same distance from the sea. 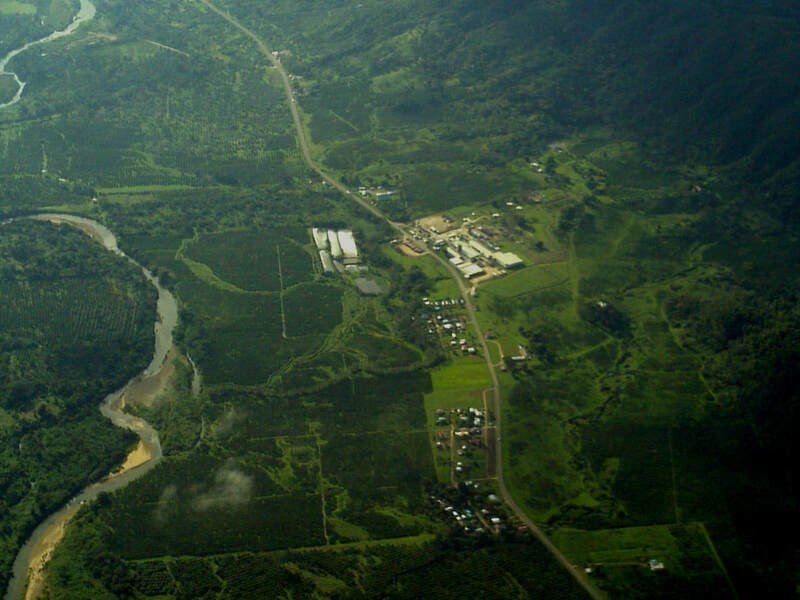 This can be caused by the effects of being sandwiched between the Macaroni Hills and the Maya Mountains at a higher elevation and the many streams that flow in this area. The high mountains trap the heavy rain clouds and in effect create a perfect example of the water cycle taught in schools. When visiting this part of Belize one should not be surprised by a sudden heavy downpour at any time. Another reason for the cool climate is the fan like shape of the lower valley (see DEM) which opens toward the sea and channels the wind through the mountains. The land breeze and sea breeze creates this constant cooling effect at night and early morning. This is especially evident during a northerly from November to February when this area is definitely cooler than the nearby coast as wind is constantly channeled through the mountains. Did you know? The colonial government in 1930 installed measuring instruments for weather at Middlesex, Pomona and Agstat (Agricultural Station Melinda) because of its importance to the agriculture industry in the area. 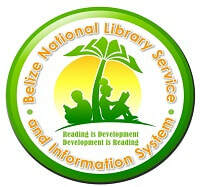 In the past the weather report by the National Meteorological Service of Belize included data from this area. Instruments like a sunshine recorder and rain gauge can still be seen at Middlesex and an instrument to measure the earth temperature exist behind the factory compound at Pomona. It would be fascinating to get these readings of these instruments from the 1930’s to prove the hypothesis of global warming and to see how much the temperature have warmed from then to now.